Roughly a year ago, I got my Figuarts Super Mario figure. While it was a decent enough figure on its own, I was disappointed. It was a very simple figure with poor posability, and the accessories only highlighted the fact that there are more interesting sets sold separately. Now it’s Luigi time, sold at a similar price. Has there been an improvement? Well, basically no. 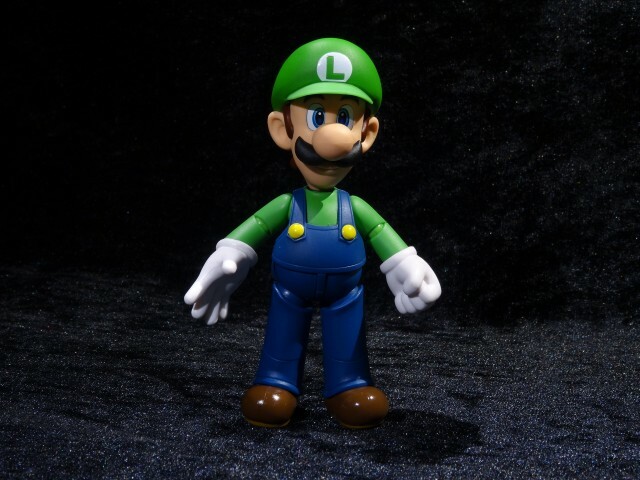 Luigi is constructed in the same way with very basic posability, although he feels easier to move around than Mario who sounded like he was about to crack all the time. There is still very little articulation and still no alternate facial expressions. On the plus side, it’s a very sharp and detailed figure with a nice, stoic expression that’s maybe a bit more usable than Mario’s crazy cheer. Luigi comes with a few more accessories. There’s a flexible posing rod with several different attachments to hold either Luigi himself (via an adapter that fits on his back) or a basic brick block suspended in the air. Luigi has a set of extra hands that lets him carry stuff, and there’s a Koopa shell to carry around. I used the open hand to give him a little more personality, but there’s still very little you can do with the actual accessories. There are now another two accessory sets, one with a red tube, a Piranha Plant and a Buzzy Beetle, and another with a whole menagerie of a Koopa, a Goomba, a Boo and a Bullet Bill. Upcoming are also a Yoshi figure and a Fire Mario variant. These are all neat, but at around $30 a pop this diorama theme is very quickly becoming very expensive. For now I’ll assume they’ll keep going, and I might want to get a Peach and/or Rosalina down the line. Luigi is slightly better value than Mario to me since I like him just a bit more. Despite the lack of articulation and the high price, these are still very accurate figures. But it annoys me how the similarly priced Revoltech and Figma figures offer so much more. 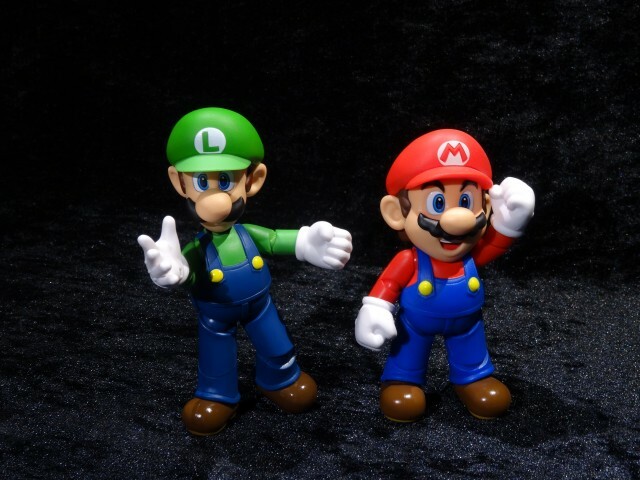 Det här inlägget postades i Modeller, Prylar och har märkts med etiketterna Figuarts, Super Mario. Bokmärk permalänken.